A lot of beautiful outdoor seating are designed for cooler climates with a little bit of sun and not for tropical climates like ours. However, there are still ways to enjoy the outdoors when the weather permits. Here’s how you can set up outdoor seating in our warm climate! Sometimes the best outdoor seats are the ones that are just thrown together in a few minutes. 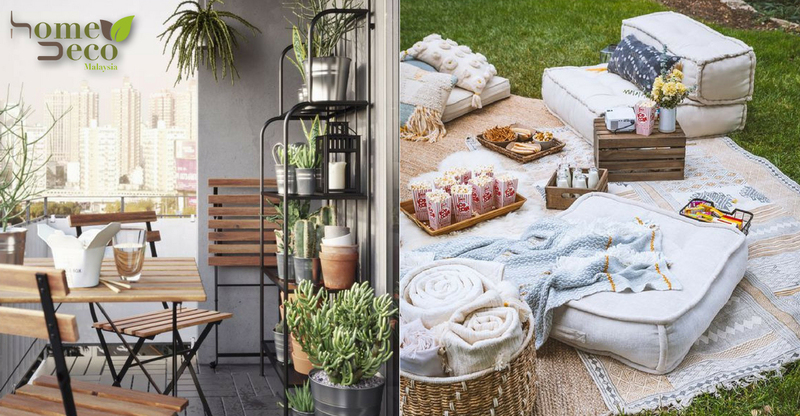 Throw out a blanket or outdoor rug with some seat cushions and the family is all set to enjoy the outdoors. The casual set up is much more relaxed and thus more enjoyable. Without rigid seating, younger kids get to run around and play while the adults lay back or chat. Warmth is nice but too much sun is not good at all. Other than protecting the family with sunblock and sunglasses, try positioning the seats under a shadier area like underneath a few trees, a shadier part of the garden or under a shade. The shades can come in the form of a built patio roof, a fabric canopy or a standing umbrella. Shaded benches such as arbours are good alternatives too. The outdoor space should encourage the family to spend more time outdoors. A way to do it is to mimic the style of the outdoor seating area after a dream getaway. For families that enjoy going to the beach, the look can be mimicked by having some lounge chairs, ocean blue cushions, green plants and perhaps a lantern. For those without a garden or a backyard, they can mimic the Parisian balconies with stylish table and chairs. The balconies can be lined with small shrubs or flowers too! An alternative is to have those beautiful wooden armchairs that are wide enough to sit cross-legged. To inject fun into outdoor seating, install swing benches or swing beds. Families can lounge and gently sway while enjoying the views. Hammocks and smaller swings such as the ones sold in rattan shops work just as well too. When all is said and done and the wind dies down, bring out the big fans for some respite. While the fans may discourage some bugs from getting nearer, it’s good to put some natural mosquito repellent remedies in place such as lemon with cloves or making use of essential oils that are proven to work. Essential oils can also lightly fragrance the outdoor seating area.